A number of popular Amish markets can be found in Maryland, concentrated around the Washington, DC and Baltimore areas. In addition to urban markets, an Amish settlement of around 1500 can be found in St. Mary’s County, with a number of households selling cheese, butter, eggs and other food products. Find a Maryland-area market in the list below. You can also view a full directory of Amish Markets in the US. Know of a good MD or DC Amish market? Let us know in the comments section. One of the biggest markets in Baltimore area, providing a wide array of products including Amish made foods and goods. Homemade Amish goods such as fresh baked pies, rolls, bread, homemade peanut butter, pretzels, cheeses, meats, fresh produce and much more. Light accessories, gifts, crafts and Amish built furniture available as well. 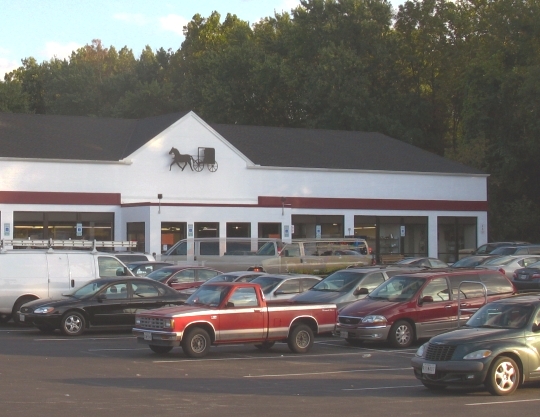 PA Dutch Market is located on the north side of Baltimore off of Interstate 83. At Joppatowne Flea Market you will find such Amish vendors as Dutch Delight, King’s Cheese and Deli Meats, Country Fresh Produce, Kreative Kitchen, Dutch Pantry, Homestead Design and much more. Serving Germantown and surrounding areas since 1996. A range of Amish homemade products including all kinds of baked goods, fresh produce, dry goods, Amish soft pretzels and a selection of candy. Provides a range of Amish homemade product from cheeses, meats, bulk foods to candy, baked goods and pretzels. Large selection of Amish made meats, baked goods, candies, produce, poultry. Offers an extensive choice of Amish homemade products from Lancaster County, Pennsylvania. At the Market you will find fresh produce, cheeses, meats, candy, bulk foods, baked goods and much more. Dutch Market restaurant can be found here as well. A broad choice of food such as baked goods, meats, cheeses, bulk foods, pretzels. Gifts, crafts, furniture, quilts and much more, sold both by Amish and non-Amish vendors. Please update this web page and add hyperlinks to the websites listed for each market. Currently, a user has to cut and paste for each location –the website address into a browser and that is very antiquated (old) and not user friendly. That is all. Thank you.